When we started selling HERMS coils 2 years ago, we made our 40cm coil 15 meters (50 feet) long. The 30cm coil was 11.5m long. Why? That’s what most home brewers were doing. But we recently started to suspect that such a long coil is not optimal. Sure, a longer coil will give you a higher output temperature, but it will also have more friction, reducing your flow. Each extra loop of the coil will cause a small temperature rise, but with diminishing returns for each extra loop. But each extra loop will also add a additional amount of friction. The amount of heat transferred to the mash tun depends on both the achieved input-to-output temperature difference and the flow rate, so there is a length that results in the maximum heat transfer. We set up an experiment to estimate what this length would be. Below, you see a photo of the HLT we used for testing. 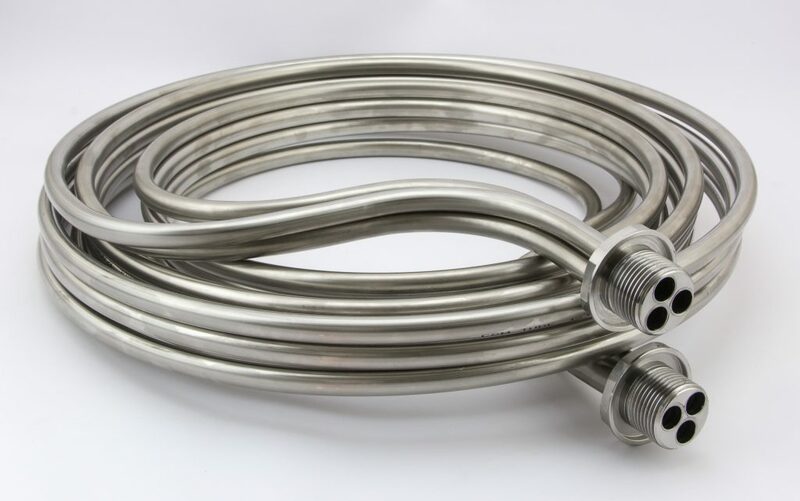 It has a 40cm HERMS coil, made of stainless steel tubing (0.5mm wall thickness and 11mm inner diameter). The element is a 3500W element. Elco dry fired it once, which is why it turned black. It still works fine though. On the bottom right, you can see the temperature sensor and the dry fire protection which was installed after ruining the element. Based on our experiments, an 8 meter coil maximizes the heat transfer. This of course depends on many factors, like the coil material, your pump pressure and other losses in the system. We also found some other simple optimizations you can apply to your brewing setup and came up with a complete new coil design for big kettle setups. Hot Liquor Tun setup with whirlpool, heating element and HERMS coil. So to heat up your mash as quickly as possible, you want to maximize this equation. 1. How much does each loop of the coil contribute to temperature rise? It costs a lot of work and money to make multiple coils of different lengths, so we came up with an alternative: we decreased the amount of water in the HLT, submerging only a fraction of the coil. 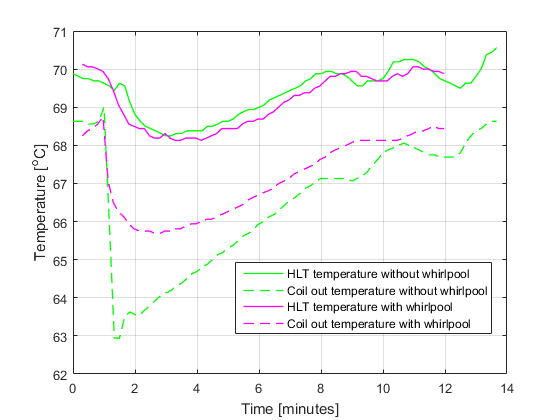 We assumed that only the submerged loops are contributing to the output temperature significantly. Hot Liquor Tun water levels for each successive test. 2. How much friction does each loop add? This one is a bit harder to test, so we took a more theoretical approach. We measured the flow rate twice, once bypassing the entire coil and once pumping through the coil. From the difference in flow rate, we calculated the friction factor of the entire coil. We used that value to calculate the friction that shorter coils would have. 9.8 liters per minute without the coil. Switching between with and without coil could be done by simply toggling a valve. Because it is fully automated Elco’s system has a lot of tubing, meaning there will be a lot more friction. In simpler setups with less tubing you will get higher flow. We correct for that later. There’s a lot of math in this section, feel free to skip it. What we did is measure the flow with and without the coil and from the difference we calculated the friction of the coil. To calculate (flow velocity in meters per second) we used the Bernoulli formula. This allows us to calculate K, our dimensionless loss factor for everything except the coil. Now that we have a good estimation for the loss factor K, the friction factor of the the coil can be determined from the difference in flow velocity. The pressure of the pump does not change, so we can solve the following formula. Now that the friction factor of the coil is calculated it can be used to estimate the speed of the wort for different coil lengths. We got a resulting friction factor of 0.0407, giving the following flow curves for a K of 30. To mimic our experiment in this setup, select the mash recirculation step. By toggling valve v6 we could bypass the coil. With the temperature sensors inline with the coil, we could measure the coil in and output temperature. This router cluster gets clean water from the left or wort from the right. The connections at the bottom are MT in (v3) coil out (v5) coil in (v7) or BK in (v8). By toggling v6, in between v5 and v7, we could bypass the HERMS coil. 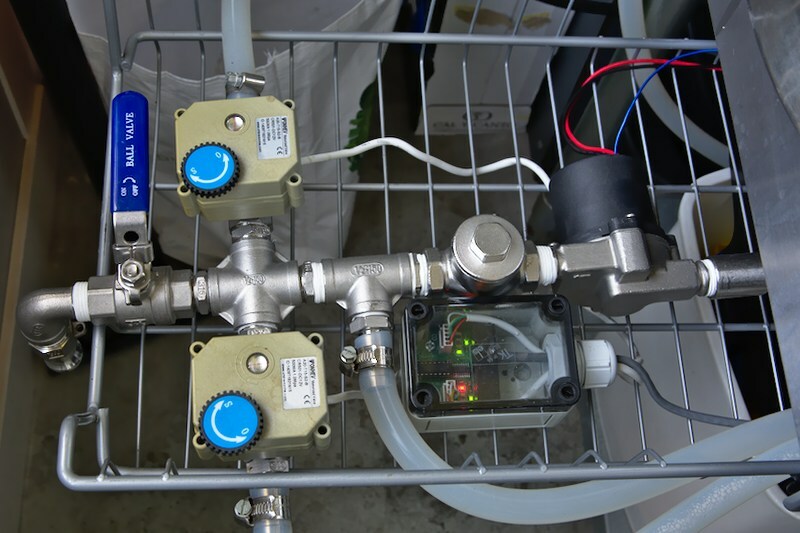 This shows the water input on the right, with a valve for the water pump cluster and the CFC and a ‘to fermenter’ output on the left. As you can see from the photos above, Elco’s setup has a lot of tubing and valves. This results in a lot of friction in the system, and therefore a high K factor. We think a K of 15 will be more representative of a typical homebrew setup. A loss factor K of 15 will result in the following flow charts. For each measurement we started the HLT at 70 degrees and the MT at 55. We then closed valve v6 to switch from bypassing the coil to pumping through the coil. After each run, we would discard some water from the MT, add some fresh cold water and make sure it was back at 55 degrees with the same volume for the next test. Each experiment would give us a set of points for the efficiency for a certain coil length. You can see these as a set of dots in the chart below. We only used the points for which the input temperature difference was between 4 and 8 degrees, which is the typical use case. We fitted a curve through these points, with the formula where is a time constant based on the lumped thermal capacity model. Our fitted curve has a time constant of 4.5, of 0.79, and is the time spent in the submerged part of the coil, which can be calculated form the flow velocity. 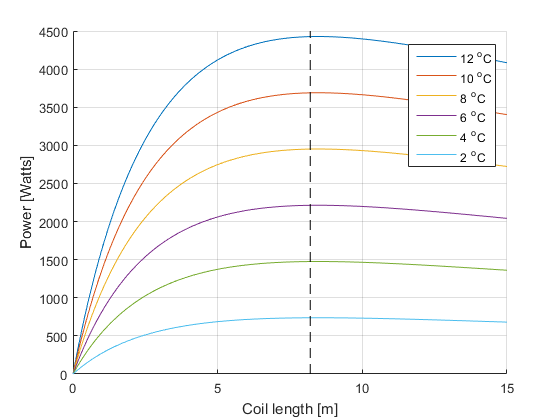 Now we can use this formula to calculate the coil output temperature for different lengths by calculating the time spent in coil ( ) first and entering it in this formula. 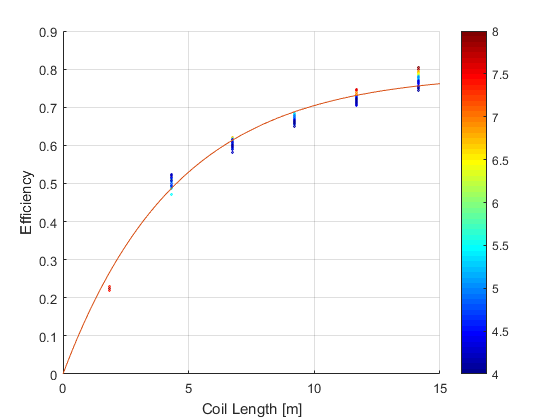 Now that we have determined how coil length changes flow rate and efficiency, we can use the formulas to calculate how much heat will be transferred for each coil length and temperature difference. As you can see in the chart below, the curves are as expected: making the coil longer increases the efficiency, but after a certain point the loss in flow rate cancels out the higher output temperature. We have found 8.2 meters (dotted line) to be the most efficient length. The graph above is calculated with K = 15. From the graph, you can also see that if your temperature difference is small, the power with which you heat your mash tun is low. During our experiments, we also found some quick improvements you can use to make your own mash go faster. We did our experiments twice, once with the wort entering the coil at the top and leaving on the bottom and once the other way around. It turns out that having the wort in the HLT coil flow from top to bottom is more efficient that from bottom to top. This is because the water in the HLT is hotter closer to the element, even when there’s a whirlpool in the HLT. Our experiments found a 12% increase in efficiency when wort flowed from top to bottom. With a 4 times smaller HLT, you can heat your mash 4 times quicker without overshooting. If you use BrewPi for mashing, you would set your Kp for the PID that manages the HLT setpoint to the to automatically manage the HLT setpoint. You can use a big kettle for your HLT, but don’t fill it up fully until you are heating your sparge water. Use a low and wide HERMS coil if possible. We measured the temperature response with and without recirculating our HLT water. This makes a big difference in the temperature exchange, as you can see from the graph below. 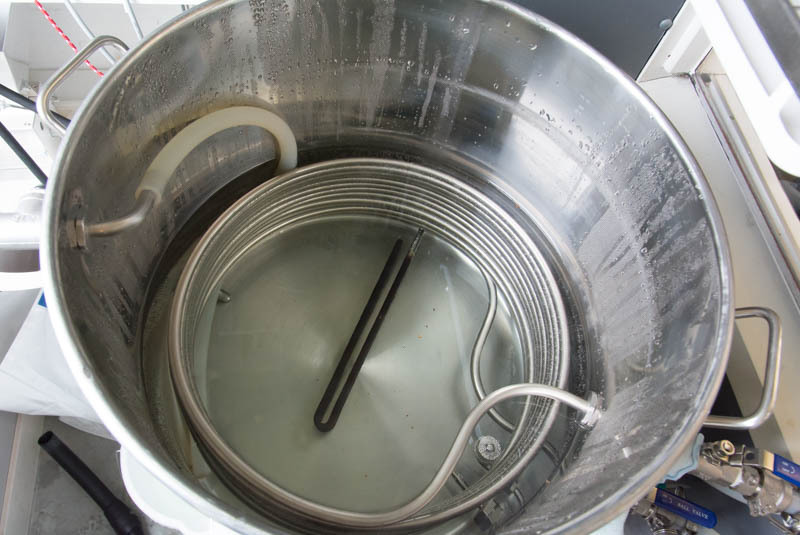 Without stirring your HLT, the water around the coil will be a bit cooler, decreasing the output temperature. We changed the HERMS coils we sell based on these experiments. Our 30cm HERMS coil has been shorted from 12 windings to 8 windings. It is now 7.5m long instead of 11.3m. 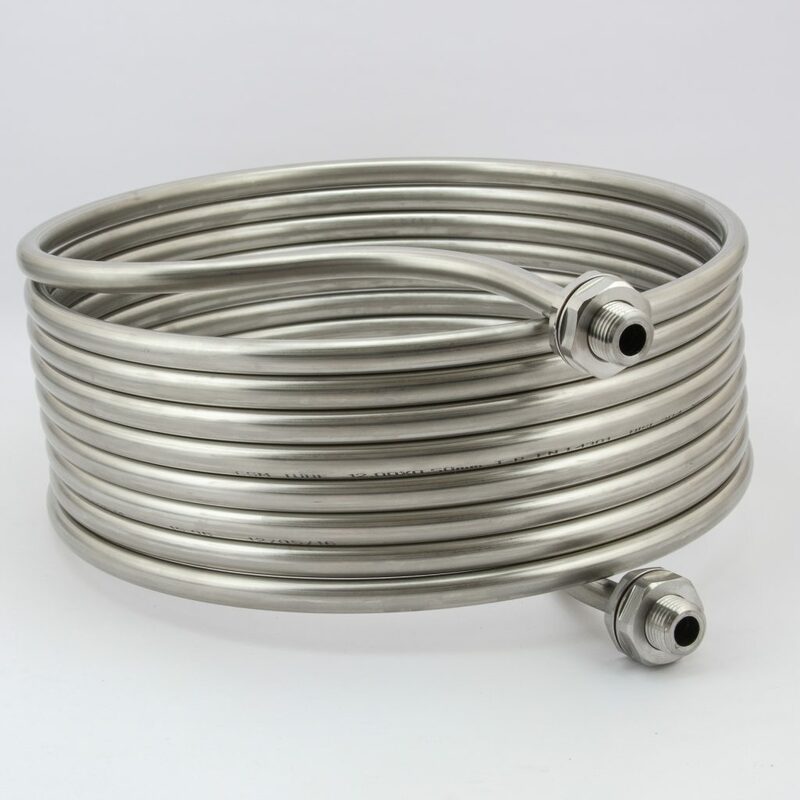 We are going to discontinue our 40cm HERMS coil, which was 15m long. The longer coil does not help with heat transfer. We have come up with an alternative though! For big kettles, we have made a prototype of an entirely new design, suitable for big kettles and high power elements. The only way to do both at once, is to increase the diameter of the coil. We chose to do this by having 3 coils in parallel, ending in one 1 inch fitting. A very low height, making it possible to have only very little water in the HLT to be able to work with bigger temperature differences. The 30 cm HERMS coils are back in stock now. For the new 3-way parallel super awesome high flow coil, we only made a few prototypes. They’ll be available in about 4 weeks. You can find our new coils here. Thanks for sharing your research and great work! I love when there’s science behind the claims. That 3-way coil looks so cool! Great work Elco! Sorry on the possible OT but I saw some mentions of this on Reddit, and would like to know your opinion on how could these findings be applied to CFC (ie tube length, increasing flow rate, maximizing contact area etc.)? I was thinking of doing a similar experiment but it was too expensive to start with and there were too many variations in the mix (outer/inner diameter, convoluted copper vs regular one, the possibility of soldering wire in a spiral on the outside of inner tube for breaking of laminar flow, input water temperature etc). What interests me is which parameter would be the most beneficial one to the whole system (flow, area, temperature difference…). Something like this maybe in combination with our sealing locknut? SS brewtech also has a hole plug and so does blichmann. 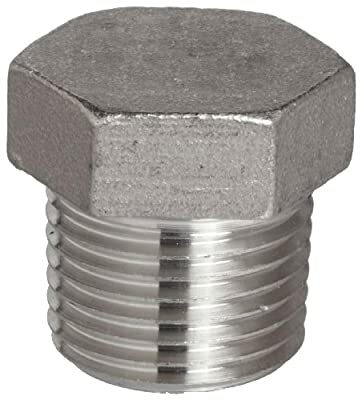 The SS brewtech plug is 17mm, so it is probably too small. You could also stretch the new coil to the old height, but this has the downside of having to put more water in your HLT to fully submerge it, which will result in having to do smaller and slower temperature swings in the HLT. Maybe you could also install a float switch in the hole.